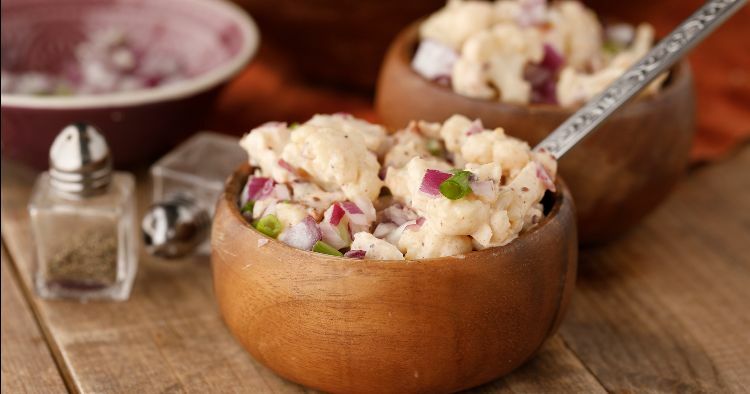 If you're following a low-carb diet, one summer staple is definitely off the table: potato salad. But there are low-carb versions of this dish that you can enjoy. The recipe below is one of them, subbing low-carb cauliflower in for potatoes. You'd think that the swap would make this dish a completely different salad, but oddly enough, the mild flavors of potato and cauliflower can stand in for one another perfectly. 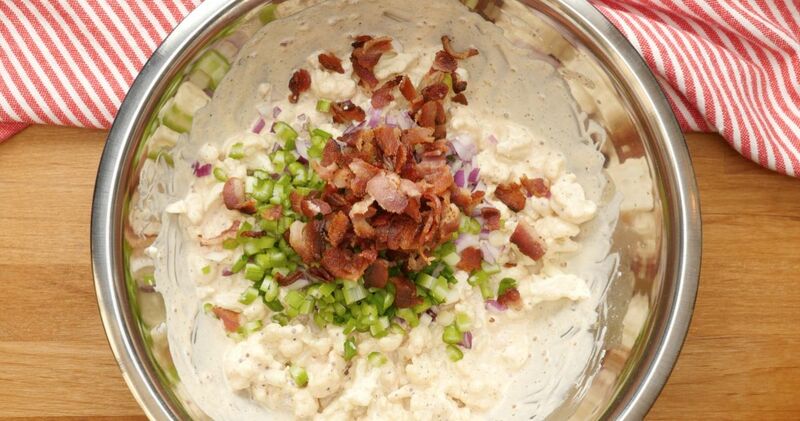 The mayonnaise-based dressing is a dead ringer for potato salad's sauce, and a sprinkling of bacon over the top adds richness and crunch. This salad may replace the summer classic once and for all. 1 pound cauliflower, broken or cut into bite-sized florets. Place the cauliflower in a microwave-safe bowl. Microwave for about 5 minutes, or until tender. Run under cold running water until cool and set aside. In a bowl, combine the mayonnaise, sour cream, vinegar, mustard and spices. Add the cauliflower and toss well to coat. Add the red onion, scallions, celery and bacon. Toss to combine. Garnish with fresh diced onion and scallions upon serving (optional).